The Cairngorm Biathlon & Nordic Ski Club is for the first time developing British non-military biathletes at a young age - and is great step for the future of UK cross-country skiing and biathlon. Come along to Glenmore Lodge near Aviemore on a Wednesday or Thursday evening from April to October and you’ll see and hear a bunch of young athletes flying around the roller ski track.. Famous for its steep slopes and narrow bends the Glenmore track is renowned for its difficulty. But no-one has told the young athletes who practice here how difficult it is. Nearly all can ski the ‘easy’ range loop and many ski the western figure of 8 with ease. A few even fly down the unbelievably steep main slope. These youngsters impress with their commitment to the sport and their competence. Led by Head Coach Mike Dixon the athletes train in 3 groups with coaches Al Dargie and Roger Homyer. One group can be seen doing interval training around the range loop on freestyle/skating Start skis. They then break to do 5 easy figure of 8 loops under the guidance of coach Al. Mike’s group have put on Start classic skis and are practicing weight transfer on the grassy bank between the range and the track.. Next they are off double poling with Mike giving his usual positive feedback to everyone individually. Meanwhile a third group are following Roger around the flat area next to the range. They practice tight step turns and turn their circle into an impressive figure of 8. Then off around the range loop skating without poles. This group contains young athletes and those who may only have started last week, yet their progress can be astonishing. Each group take turns to stop and shoot. The club is the proud possessor of some very nice kit. Biathlon air rifles with diopter sights shoot very accurately over 10 metres on the range. The athletes are taught to see the sight picture and shoot instinctively. No biathlete can afford to think “that’s right, now pull the trigger” because the rifle moves in a heavily breathing shooter. They shoot in groups of 4 with the other group members running/jogging before coming onto the range out of breath. Again, the shooting groups of pellet holes obtained are impressive. Even a complete beginner can shoot well. 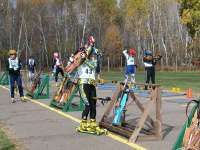 Occasionally the .22 biathlon rifles are brought to the session. Mike and Al work really hard loading and helping the youngsters to zero. They fire 5 shots at a paper target 50 metres away and the sights are adjusted for elevation and windage. Then its shooting at the biathlon targets which submit with a pleasant chink when struck. Most club members shoot using a shooting frame which allows them to rest the rifle stock.. At the recent club championships some very impressive (and brave) shooting performances were seen. The penalty for a miss? An extra running loop for each missed shot. Don’t miss or you’ll have to tough it out. Then all the groups come together for a final session. This could be flatland slalom, sprints (no-pole, skate, double pole), skier-cross involving slalom, jumping (don’t try this without practice) and the famously named Roypoloy, a 360 degree turn around a cone named after Roy Young at our friendly rival club Huntly. But tonight the group are divided into teams of 4 each with a classic skier. Then they are away around the range loop for a relay competition. 6 classic skiers vie for the lead before passing their team-mates in the relay box who skate off at great speed. The intensity of competitiveness of these young people must be apparent to people looking down from Cairngorm summit! No-one can tell which team won although one group claim victory with their arms aloft. The whole session is watched by some very hard working and supportive parents. Karen collects in money (£2 per session) before putting on some roller skis (if any are left), Elaine dishes out the kit and tries to find those elusive size 8 combi boots, Diane, Greg, Gill, Hamish, Lesley, Norrie, Gillian, Nicola, Rex and Gerry make appearances on the track sometimes after sorting out young athletes kit. Other parents manage the club funds (thanks George) and a whole host of tasks which have included digging out the bank at the back of the range and shifting what seemed like 100 tons of earth, Dulcie maintains the club website (look it up its great www.cbnsc.co.uk), driving folk to and from club sessions and to British series races and putting up tents for the club open day. It has also been great to welcome adult members along to our sessions. Perhaps we need a coach to take this group? If you wished you had made it to our ski camp then don’t worry- there’ll be another next year, or you can come along to one of our winter sessions on a Saturday at the Lodge. Bring your skis in case we have snow. Be warned though, we will try to make you a member and you could even find yourself with a job to do (that’s how we all got collared). You’ll also have to switch off Eurosport with Mike and come along and listen to Al and Roger instead. The young athletes themselves are impressive individuals. We are proud of them all and the development they have made. Worth a special mention are Al Duncan, now training in Canada, his sister Alison closely battling with her twin sister Caroline, who join Cammy Dudgeon, Fiona Crossley and Mike Dixon as British roller ski series champions. There is huge potential throughout the club but we are particularly strong in the 10-14 year old age group. Who knows what these young people can achieve? Their spirit was evident in the recent Cairngorm hill climb event held on the ski road leading from Glenmore to the Corrie Cas car park on Cairngorm. Al and Nicola Dargie organised a fantastic open series of races. Young racers raced along the road past the Hay Field and then climbed up towards the Sugar Bowl. I can speak from grim experience when I say the 300 metres before the Sugar Bowl is tough, tough, tough. 20 year old Ruth competed in the senior class who climbed right to the top of the ski road. She showed amazing grit and determination to complete the course. The CBNSC spirit! So the future seems rosy but we cannot stand still. There is that adult roller ski group to sort, archery was immensely popular on the ski camp so we plan to introduce this to our sessions (and ski archery too), we have some great roller ski and shooting kit but we need more, snow skis need to be bought too, we have planned a short series of snow races in the area which will go ahead at short notice when the snow comes to the glen, some of our young folk are training with the British Nordic Junior Development Squad and need even more help and support, and Al has used all his skills to negotiate a great sponsorship deal with Rob at Mountain Spirit (www.mountainspirit.co.uk the shop in Aviemore) and Haglofs clothing (www.haglofs.se). Then of course there is the club log cabin that needs to be built (we are jealous of Huntly Nordic Ski Club’s cabin), the range hut needs sorting as usual, and why not have telemarking sessions on the hill in the winter? Our membership has grown to 80 with between 25-30 youngsters coming regularly to training sessions., so why not be able to enthuse and inspire 50, 60 or even more on a regular basis and become one of the top sports clubs in the area? We are always grateful to our landlord Glenmore Lodge. Tim Walker, the principal, has been exceptionally helpful with club requests for storage and lecture rooms. They even provide a bar (with the best views in the land) which acts as a refuge from the midges in late August. You can contact the club through our web site. Alternatively contact me (Roger) on roger.homyer@tesco.net. I’ll be delighted to answer any of your questions. One last thing. Thanks to Paddy and Hilary and all who put this splendid magazine together over the years. I shall miss it. It's great to see a former army biathlete bring something back to the civilian world of skiing, and will perhaps inspire others to emulate the success of the club in other parts of the UK. With the kids' early signs of promise already in evidence, it just shows how much can be achieved through hard work from coaches, and good training on rollerskis. Learn to cross-country ski in London!